Originally published under the title "Syrian Diplomatic Push Doomed to Fail." The Obama administration will spend its final year attempting "to de-escalate the conflict in Syria...through a political transition." This effort to impose a diplomatic solution on Syria will be lauded as a great success by the State Department and recognized for the failure it is destined to be by nearly everyone else. John Kerry may get his temporary cessation of killing, but not of hostilities. He may preside over grave and haughty signing ceremonies, but few of the parties will abide by the promises they make. An admirable impulse to own the moral high ground, never "stoop to the enemy's level" and exercise all diplomatic efforts before, during, and after a war has taken hold of all levels of the US government, but the results are often counterproductive. Diplomacy only succeeds when backed by a credible threat of force, and few believe that the U.S. will exert anything beyond the bare minimum in Syria. The president has somehow failed to learn the most important piece of advice Machiavelli gave to the prince – "it is better to be feared than loved." The United States has lost its capacity to inspire fear. In Syria the US lost its capacity to inspire fear in 2013 after Assad was allowed to cross with impunity Obama's "red line" on the use of chemical weapons. Secretary of Defense Chuck Hagel recognized the harm that would come from failure to follow through on the threat, but his advice to bomb Damascus was rebuked, leading to his departure from the administration. World War II was the last large-scale conflict to end in unconditional surrender. With the advent of the United Nations, conflicts have ended through diplomacy, which is to say that one side of a conflict has either agreed to compromise, pretended to compromise or was forced to compromise. Unless one side is defeated, or convinced that defeat is inevitable, the conflict persists. 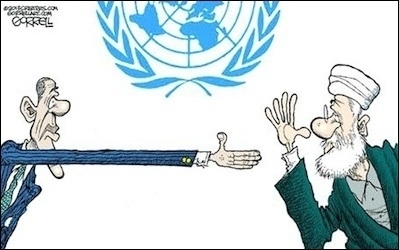 The UN has become a great facilitator of stalemates. Any UN-imposed diplomatic intermission, like one in late December between Assad and rebels allowing evacuation of civilians from three towns, may offer the virtue of a temporary cessation of violence, but diplomacy alone can never create peace. On rare occasions when both sides of a dispute are willing to compromise, as in the voluntary separation of Czechoslovakia into the Czech Republic and Slovakia, peace can be authentic and lasting. More often though, one side is unwilling to compromise, resulting in a situation like Korea, where nearly 30,000 US troops have enforced a precarious peace for half a century. Another model is Vietnam, where the Paris Peace Accords led to an agreement that was breached even before the last US helicopter left Saigon. And then there is Israel, capable but diplomatically unwilling to eliminate the threat from its belligerent neighbors. The UN is able to create the illusion of peace but unable to alter conditions that lead to war, especially as in Syria where all the combatants are intransigent. Only the U.S. wants an agreement, any agreement. The Obama administration's diplomatic efforts have everywhere been dismal. In spite of great expectations to the contrary, the Obama administration's diplomatic efforts have been dismal, from its failure to secure an effective Status of Forces agreement with the Iraqi government (depicted by the press as a campaign promise kept) to its obsequious JCPOA with Iran (depicted by the State Department as an important breakthrough), thanking Iran for taking care of the U.S. sailors they held hostage. It negotiated arguably the two worst prisoner exchanges in the history of prisoner exchanges: five American citizens held hostage for the crime of being American traded for seven convicted criminals who happened to be Iranian. Before that it was five top Taliban commanders traded for Pfc. Bowe Bergdahl – hailed by Susan Rice in 2014 as "a young man...who served with honor and distinction," charged in 2015 with desertion and misbehavior before the enemy and facing a General Court Martial in 2016. At a very strange Rose Garden announcement with Bergdahl's very strange parents, Obama called it "a good day." It wasn't. Any UN-approved, John Kerry-led State Department initiative in Syria, like the one Kerry announced in his January 13 speech to the National Defense University, will likely lead to another bad day, with US enemies strengthened and US influence weakened. Since none of the major parties currently has much cause to fear the US, look for an emboldened Assad and increased Russian and Iranian influence. Rather than the demise of ISIS, expect a further marginalization of the Kurds and Israelis. For the next president's sake, for everyone's sake, let's hope no one draws any more red lines.